At the end of a long week, rounding up by sharing something about ‘four flavours of culture’, built out of the semiotic square i shared earlier int eh week. For me, this was something of a breakthrough: starting to consider two aspects: ‘trust’ and ‘mistrust’ as separate things. I had already been clear that i was considering a spectrum of ‘trust’ to ‘no trust’, not a sense that there was an ‘opposite’ to trust. But now i’m looking at it as parallel structures: so you have have ‘trust’ and you can have ‘mistrust’, and that the two may coexist. This diagram illustrates the two dimensions, with Trust running top left to bottom right, from high to low, and crossing it is the second axis that shows Mistrust, running top right to bottom left, again, from high to low. This gives us four spaces to plot in. 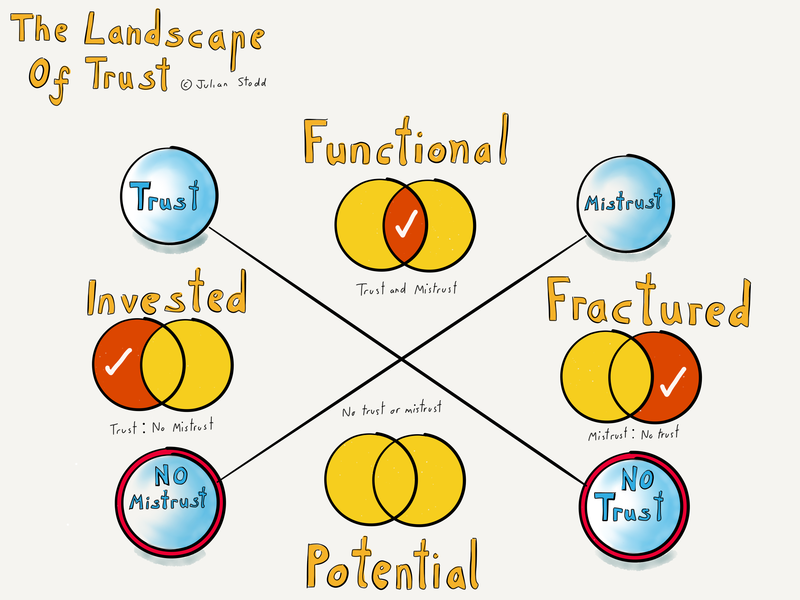 If we have high trust, and simultaneously have high mistrust, then we may have a ‘functional’ culture: a functional culture is one that may deliver, but has low investment of trust, and hence low ability to adapt. A functional culture is a kind of baseline: we can operate a business in a functional state, but it’s not going to win any races. If we have high trust, and no mistrust, then we have an invested culture: people are willing to take risks, because the level of trust is clear. An invested culture is what we want: whilst we may never achieve a fully invested culture, this is why i talk about ‘incremental gains’, of marginal returns: even edging into this space will give benefits. No mistrust and no trust may seem like a good thing: it’s a space of potential. But it may be highly unstable: when the baseline is nothing, we may easily tip straight (and deeply) into either invested or fractured states. So potential, but not without risk. High mistrust with no trust is a dangerous place to be: the culture is fractured, even if we can’t see the cracks: they are internal, because with no trust, we know that people are less likely to share, to help, to engage. It’s hard to shift a fractured culture, and hard to drive change against this backdrop. As i develop the Landscape of Trust research, i’m looking to be able to plot the results against this (or whatever grows out of this). Using this as the metric, we can explore how to shift the points, how to nudge the culture: either from functional to invested, or simply from fractured into having potential. Change is a journey: earning trust and eroding mistrust are key parts of that journey. This entry was posted in Culture, Trust and tagged Culture, HR, Investment, Landscape of Trust, Leadership, Mistrust, Trust. Bookmark the permalink.